Need The Marine Corps’ CACCTUS program will support a live, virtual, and constructive training environment that facilitates the interaction between and among levels and echelons of command and control agencies normally found in the tactical environment in the conduct of real-time combined arms fire support operations. Combined arms exercises train and rehearse the exercising force (EXFOR) personnel in the tasks of coordinating multiple supporting arms with maneuver. Training exercises take place in Combined Arms Staff Trainer (CAST) facilities, and may involve 100 or more participants at various stations in the facility, carrying out their respective operational responsibilities. There is an emphasis on providing the EXFOR the experience of performing a role in scenario-based combined arms exercises, so that training is experiential. Exercises in the CAST facilities center on communication, coordination, and deconfliction in combined arms operations involving teams of personnel with different responsibilities. In the upgraded facilities, instructors will require a set of tools to help detect training points during the exercise, and assemble after action debriefings for the exercising force. Solution Stottler Henke is developing the AAIRS toolset for CACCTUS, with a combination of technologies including intelligent simulation event detection, speech analysis on voice-over-IP communications, monitoring of commands given with digital C4I tools, and facilitated debrief construction. Battlespace geometry concepts must be applied by the exercising forces for the purpose of avoiding position and coordination conflicts on the battlefield which may result in fratricide. AAIRS records the training mission execution, which includes a synchronized collection of exercising force radio communications and human in the loop interaction with system components (operational C4I and simulation/simulator interface tools). Key exercise data relevant to training points are tabulated by the debrief construction tool and presented in a visual format along a timeline for instructor review. 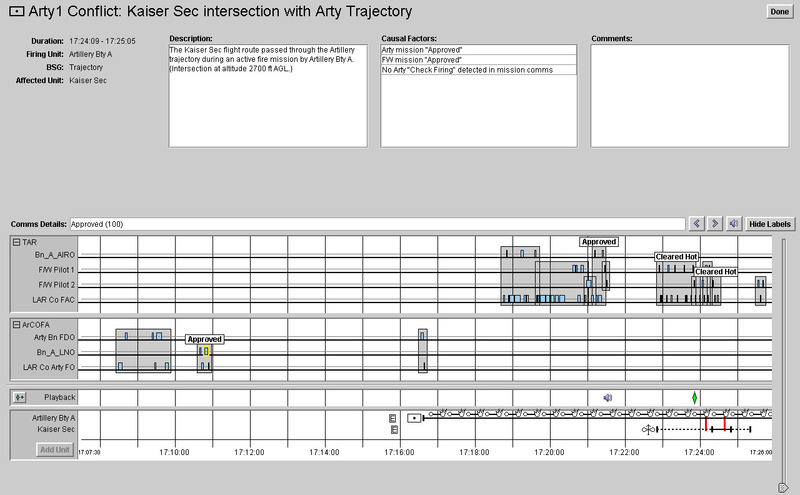 The time consuming process of reviewing sequential recorded radio communications is eased by visually representing individual transmissions on the timeline, grouped into dialogs and annotated with speech analysis results. The tool’s presentation capability allows instructors to preview their planned debrief presentation and customize it prior to formal debrief. 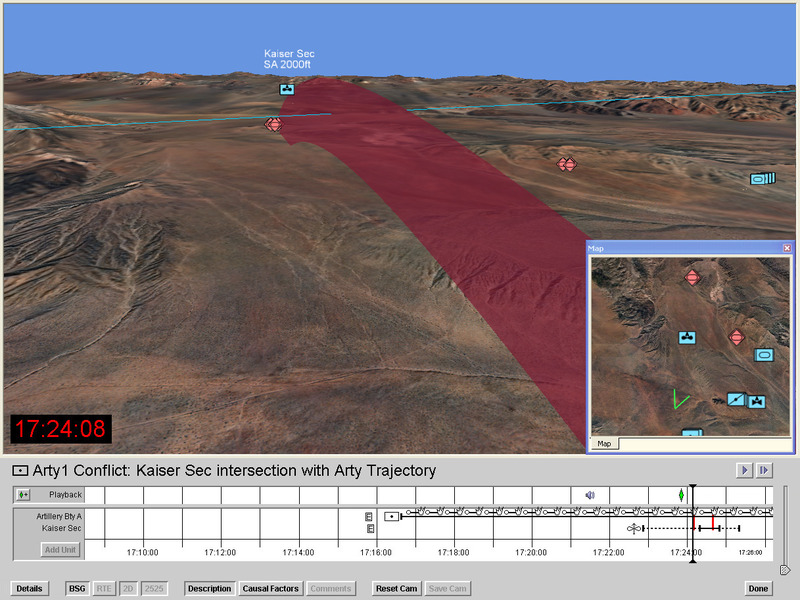 This facilitates a highly configurable after action review, where the presentation of each training point in the debrief can include descriptive causal analysis text, radio communications playback, and 3D views of the battlefield, either frozen in time (a visual “snapshot”) or played back as vignettes. For example, if a ground unit is within the fragmentation area for an artillery shell delivered on an enemy target, a training point is automatically generated, with dynamically configured playback for the after action review, and with analysis of the EXFOR decisions that precipitated the event. Related Applications AAIRS instructional methods and software technologies support team training by automatically detecting sub-optimal patterns of team behaviors (actions and communications) and by presenting this information to instructors using text, graphics, and timelines to support more effective debriefings.